The Tipster Table is based on the last 30 days selections and uses the Best Odds Guaranteed prices to record the level of profit. The overall Return on Investment is our main concern, but obviously this has to be coupled with a reasonable strike rate. All prices quoted are at Advised Odds. Back Lucrative has come storming back in to the tipster table after last being seen toward the end of April. Winners with Still on Top 10/1, Ralphy Boy 12/1, Encapsulated 14/1and Realtra 12/1 have boosted the profits back up from their negative position toward the end of July to now being a very healthy 76 points profit in the last 30 days! Flat Attack is a climber this week from the Number 6 slot last week aided with wins from Burningfivers 11/2 and Muqtaser 3/1 and an each way winner finishing second with Radhhadh 11/1 all adding to the profit tally. With the Glorious Goodwood meeting over how have the Tipsters fared over the past week. Are there any surprises in store for us? GO Racing has shot up the table to the Number One slot this past week. Gareth Owen Racing claims 20 years of experience in the UK Racing Industry. He also claims to speak daily to “connected” people knowing those whom to listen to and those whose advice to ignore. This week there have been five winners from the last eleven selections with prices ranging from Evens to 9/2. Not massive prices but the resultant 11.50 points profit has added to the current 30 day total which now stands at a shade less than 33 points. 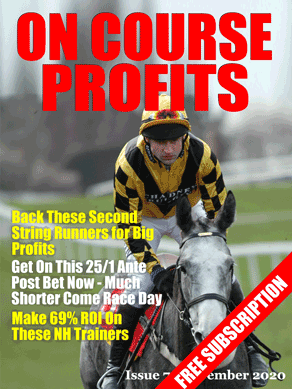 ITK Racing is a re-entry to the Tipster table this week and last seen two weeks ago. Just the five selections this week but of those there were two winners at Evens and 13/2 which has pulled them back from albeit a slight downward trend which they were on with regards to profit. It may be to keep a watching brief with this one. Before we get to this week's top ten tipsters table I just want to mention that there is a special offer at Value Backing today. Value Backing regularly feature in our top tipster table and today you can get three months for the price of one. Another relatively quiet week this week on the tipping front but we have a new Number One and some interesting new entrants. As mentioned previously the Tipster Table is based on the last 30 days selections and uses the Best Odds Guaranteed prices to record the level of profit. The overall Return on Investment is our main concern, but obviously this has to be coupled with a reasonable strike rate. The Weekender Special is a re-entry to the top slot this week with four winners from their 12 selections including Sixth Sense, Chain Of Daisies, Besharah and Tanzeel (8/1). It seems that this past week has been a quite one and many of the climbers are elevated in their positions in the table more as a result of the poorer performance of other services rather than as a consequence of their own good selections. None of us like long losing runs, but losing runs you can guarantee will occur. It is important to be confident in the service you are using that long term; overall, they will deliver overall profit to your bank. Value Backing Extra still heads the table this week even though there have been no selections for this service over the past seven days. The ROI is incomparable and as such selective betting definitely seems to be the key. We are aware of the strong likelihood that an ROI of 300% is unsustainable long term, but the service demonstrates that a consistent, steady and selective approach pays longer term. Up one place this week is the UKRN Early Bird service but again this rise is based on previous performance in comparison to the poor performance of others. There have been no selections from this service the past week and the overall performance has been a little erratic. There is a feeling in our waters that this one may fade by the wayside. Let’s hope that they prove us wrong. Another climber this week is Andy Bell, up two places. A 2/1 winner helped to steady the flow as the service dropped two points over the past week, but that isn’t detrimental given the current strike rate and ROI. Another climber two places is Win Napster and there climb is justified with Dhaular Dar a 7/1 winner from their three selections this week. ITK Racing is a re-entry having been in the table previously back in May this year with an average of 10 points profit so far this month. Hopefully they can build on this and it isn’t just a flash in the pan. Exchange Profits has had a good week this week and profits for July are now at 20+ points with 4 winners from 11 selections with prices ranging from 10/11 to 11/2. Fantastic Eights is pretty prolific in the number of selections it offers with its service and this week has seen a loss overall on the week, but they are still some 60+points in profit over the 30 day period. Gold Plated have lost some 20 points over the past week, and the number of selections has been high, but it can’t be denied that they are still over 70 points up for the month which is no mean feat. Lucky 7 Naps re-enters the table this week after a good week has brought their profits tally for July up to just over 40 points. Winners have included Wor Lass 13/2, Le Notre 3/1, Strath Burn 13/2, Pacify 7/2 and several shorter priced winners.